Hispanicize Los Angeles, the west coast’s counterpart to the national Hispanicize Miami conference, is expected to close Hispanic Heritage Month with a gathering of the nation’s most influential Latinx professionals in the Social Media arena for 2.5 days in Century City’s Intercontinental Hotel from October 11-13th. Hispanicize, originally founded in Dallas in 2009, is the largest annual event for Latino trendsetters and newsmakers in digital content creation, journalism, marketing, entertainment and tech entrepreneurship. Now in its 3rd year, Hispanicize LA expands from one to nearly three days as a result of social influencer and sponsor demand on the west coast for a more in-depth experience. The event will feature the key themes of financial literacy and empowerment, STEM education, diversity and entrepreneurship, tech innovations, community leadership and Latina motivation. Hispanicize LA offers top influencers, communications professionals and senior-level college students a networking event to hear the latest in virtual trends, connect with sponsors, collaborate with likeminded creators and advance their skillsets through professionally led industry sessions such as What’s New in Digital Trends, or Producing Viral Videos Like A Boss, among many others. “Our programming in Los Angeles aims to address the lack of diversity and inclusion in the creator industry that is often overlooked by big conferences,” said Katherine Johnson-Gunn, co-founder and Managing Partner of Programming, Hispanicize Events. “Inspiring our community and future leaders including students, Latinas and influencers is central to our goals for Hispanicize events and our brand partners who present unique programs catered for our audience,” said Cristy Clavijo-Kish, co-founder and Managing Partner of Partnerships, Hispanicize Events. The event’s returning presenting sponsor is Prudential Financial who will deliver a thought-provoking panel with a top Latina influencer to help the audience consider paths toward wealth management. Various brands are activating unique programs at Hispanicize LA designed to inspire and motivate attendees. First-time sponsors including Colgate Optic White will present the ‘Content Creators & Brands Professional Speed Dating’ as well as new initiatives from Uulala App, MusicaRoots and Major League Soccer. Returning sponsors including Microsoft, Amazon, Israel Tourism, Remitly, Dove, Nielson, Walmart, Universal Pictures and airline partner United Airlines have solid programming awaiting attendees including the presentation of top trends in travel, timely research on Latinx consumer insights, the positive impact of AI on daily life and even an ‘underarm university’ for Latinas and the latest bilingual reading technology for parents. “It is impossible to overestimate the importance of the Hispanic consumer, especially as we continue to expand our work to help put financial security within reach for everyone,” said Dorinda Walker, VP of multicultural markets for Prudential Financial. Hispanicize LA is also a launching pad for many up and coming influencers across the community. It offers newbies and highly engaged creators’ platforms and resources to enable them to pursue their goals and become role models for future generations. Some of the event offerings include: How to Fuel Your Passion, a step by step plan to establish and expand your brand, grow your network with intention and monetize your passion more strategically. For the first time, an inaugural Latinx Creator Meet & Greet open to the public, is slated for Saturday Oct. 13th from 5-7 PM will be available for consumers to come meet their favorite Latinx social content creators. The LGBTQ community continues to dominate the mainstream. See how these proud Latinx influencers are connecting with their fans on social media, and creating a safe space. Some of the event’s panels which talk about this are: Latinx LGBTQ’ Impact on Pop Culture presented by AH LOUD. Hear Valentina to Miss Vannnnjie, to Vida and Pose, discuss LGBTQ’s impact on all things pop culture. Hispanicize LA will be the scene for the inaugural Latinx Creator Meet & Greet which will be open to the public for the first time. The event slated for Saturday Oct. 13th from 5-7 PM will be available for consumers to come meet their favorite Latinx social content creators. The exclusive LA movie screening of Universal Pictures ‘Halloween’ will close-out the event with a ‘monster bash’ cocktail hour and movie viewing ahead of the film’s national opening. Now in its 9th year, Hispanicize 2018 (#HispzLA) is the largest annual event for Latino trendsetters and newsmakers in digital content creation, journalism, marketing, entertainment and tech entrepreneurship. The events held in Miami (Spring) and Los Angeles (Fall) are a launch pad for creative endeavors, new products, technologies, marketing campaigns, films, books, music and more targeting Latinos in the U.S. and/or Puerto Rico. 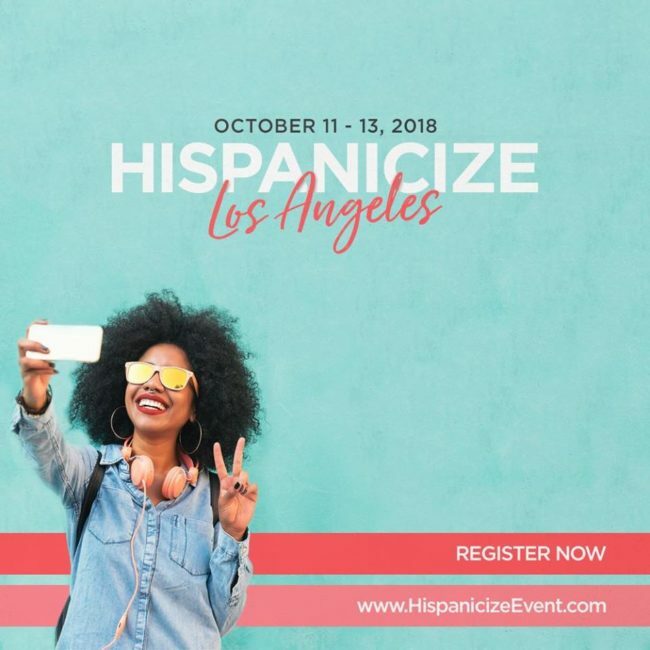 The Hispanic Heritage Month edition in LA, presented by Prudential, is expected to attract more than 700 attendees with a combination of industry professionals, senior-level college students and for the first time Latino consumers on Saturday when the agenda is opened for popular influencer Meet & Greets. The Hispanicize event is owned and operated by HMG, a multi-platform media company for multicultural Millennials and Generation Z.